9/8 Style/Class files are uploaded for the conference proceedings. 7/11 Thank you for your patience. Finally, we set up the web archives of the OHP copies of presentations. The page is password protected. The information for the password is sent to participants by E-mail. 7/2 We got inquiries about the OHP copies of presentations. We are now converting the scanned images to pdf files. Please, wait for a moment. We will inform you when they are ready. 6/12 Title of Prof. Bennhold's talk was corrected. 6/10 Title of Prof. Cheoun's talk was corrected. 6/04 Useful information for SENDAI03 participants is uploaded. was changed from 8:45 to 8:10. 6/03 Poster space information was added. the conference site to the Sendai Excel Hotel Tokyu. 5/30 Title of Prof. Schumacher's talk is corrected. 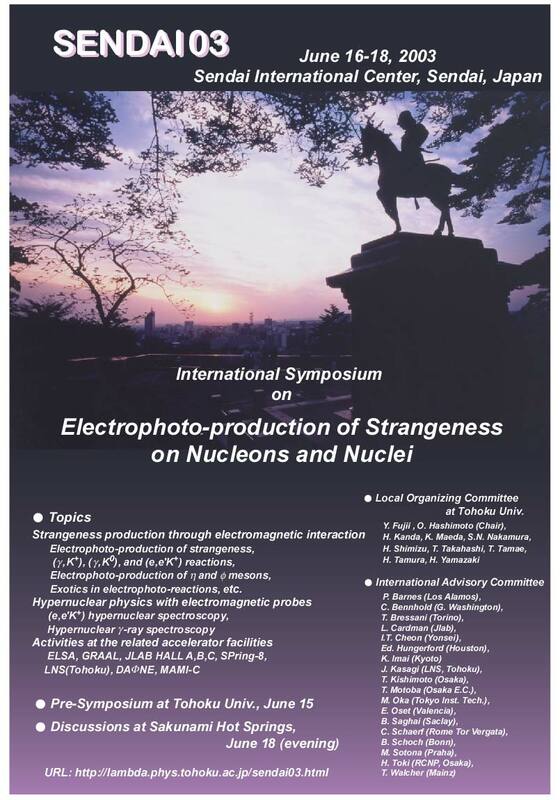 This is the FINAL announcement of the international symposium on "Electrophoto-production of Strangeness on Nucleons and Nuclei" hosted by the department of physics, Tohoku University, Sendai, Japan in June 2003. The symposium is motivated by recent progresses of the research on electrophoto-production of strangeness at GeV electron-beam facilities as well as extensive theoretical investigation in the field. The symposium will focus on the strangeness production processes and strangeness nuclear physics by the electromagnetic interaction. It is planned as a small-sized international symposium with an intention to serve an opportunity for intensive discussions in an informal atmosphere. Both experimentalists and theorists in the field are expected to get together, and exchange information on recent activities and discuss future prospects of the related fields. The main session of the symposium, which is held at the Sendai International Center, will start at 9:00 am of June 16th, Monday, 2003 and continue through the late afternoon of June 18th, Wednesday. A pre-symposium emphasizing subjects related to hypernuclear physics is organized on June 15th, Sunday. The pre-symposium takes place on the 2nd floor of the new physics building on the AOBAYAMA campus of Tohoku University, which is located on the top of the AOBAYAMA hill adjacent to the Sendai International Center. In addition, post-symposium discussion in a rural hot spring area near Sendai and an excursion are planned. The schedule of the symposium including pre- and post- symposium is as follows. The scientific program of the SENDAI03 is given below. The program for the pre-symposium to be held on the 15th is given in the next section. Next to the symposium room, a space for poster presentation and discussion with coffee will be prepared as the ``symposium meeting room''. The poster space per a person is 90cm(H)x120cm(V). For those who prepare a large poster, a few spaces with 210cm(V) are also available. Please contact in advance with organizers if you want to present posters. A one-day pre-symposium will be held in the physics building on the AOBAYAMA campus of Tohoku University. The transportation to the physics building is described below. The pre-symposium will emphasize discussion on recent progress of hypernuclear physics, encouraging young scientists including students to give a talk. Three subjects, (1) Baryon-baryon interaction with strangeness degree of freedom, (2) Hypernuclear spectroscopy, (3) Hypernuclear weak decay, will be discussed starting by theoretical overview talks and then a series of presentations of recent experimental results. The program is given below. 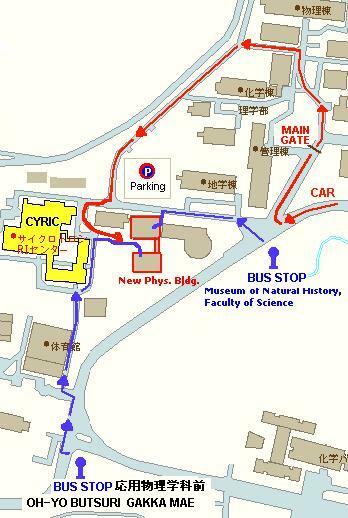 The physics building of Tohoku University is located on the top of AOBAYAMA hill and can be reached by a public bus. You can take the bus (Aoba castle round-trip-bus through the aoba-dori street) from the bus-platform no. 9 of the Sendai station, to the 'Museum of Natural History, Faculty of Science' bus stop. For those staying in the hotel ``Leopalace Sendai'', one of the organizers will meet at the lobby at 8:10 am. Post-symposium discussion is arranged in the evening of June 18, after the last session is closed. We will move to Sakunami hot-springs located in the suburbs of Sendai, where we can get in 30 minutes by car; we will stay the night at a hotel in Sakunami. A bus will pick up those who join the post-symposium discussion at the Sendai International Center after the last session of SENDAI03 is concluded in the late afternoon. Those who join the excursion on the 19th, Thursday, will enjoy interesting places in the Sendai area and will be dropped at the hotel in Sendai in the evening, unless otherwise requested. For those who plan to leave Sendai in the morning of June 19 by the 8:20 am flight (NH3132) to Narita at the Sendai airport, we will arrange transportation from the hotel at Sakunami to the Sendai airport. For people who go to the Sendai station, the transportation to the Sakunami station from the hotel will be arranged. The Sendai station can be reached by a commuter train form the Sakunami station. The city of Sendai with a population of one million is the center of the northern part of Japan, Tohoku District. It is located about 350 km north of Tokyo and can be reached in 2 hours with a super-express train (Tohoku Shinkansen). A relatively strong earthquake hit northern part of Japan on the 26th of May, 2003, but fortunately there was no serious damage to the city. The city features an abundance of natural beauty that changes with the seasons. Sendai is nicknamed 'Mori no miyako' (literally city of green), which illustrates this perfectly. The city has a rich cultural heritage stretching back 400 years to its founding by feudal lord Date Masamune. The city is surrounded by mountains and the Pacific ocean, making its weather mild for its latitude. Average temperature at Sendai in June is 18.3 C (65 F), but Japan has the rainy season in June. Therefore, it is occasionally chilly and it might be a good idea to bring an additional gauzy jacket. Further information on the city is found in the following Web pages. The most convenient way to come to Sendai from abroad is to fly to Narita International Airport (NRT). 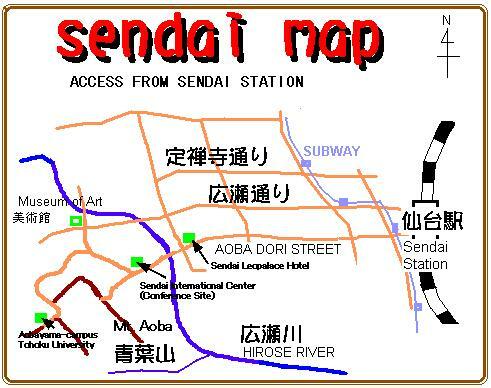 From Narita, there are two ways to reach Sendai, by train and by air, which are described below. Take a train (Narita Express) to Tokyo station and then transfer to a super-express (Tohoku Shinkansen) to Sendai. The train station at the Narita airport is located underground of the terminal #1 and terminal #2. Through tickets from Narita to Sendai together with a super-express ticket for reserved seats are available at ticket counters on the underground floor (tariff 6830 Yen + express supplement 6470 Yen for one way). It takes about 1 hour from Narita to Tokyo by "Narita Express" and about 2 hours from Tokyo to Sendai by the super-express. An alternative way is to fly to the Sendai international airport from Narita. As of June, 2003, there are two flights from Narita to Sendai and Sendai to Narita everyday as follows. Those who purchase a ticket from the "Star Alliance" air carrier may have advantage to arrange in advance a connecting flight from Narita to Sendai (1 hour). There are some international flights coming to Sendai from Asian countries and also many flights between major cities in Japan. It takes about 40 minutes from the Sendai airport to downtown Sendai by a limousine bus (one-way costs 910 Yen, round-trip 1640 Yen). 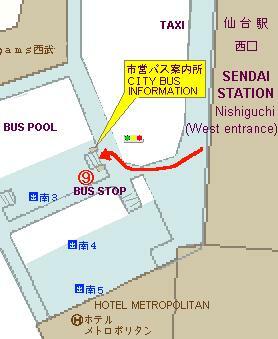 Access information on how to get to Sendai from the airport is found in the following Web page. The hotel is not in the walking distance from the Sendai station with baggages (about 2 km). Although public bus can be used, it is recommended to take a taxi to the hotel showing the attached sheet that asks the driver to take you to the hotel. Taxi ride costs about 600 Yen. Japanese Translation for "Please, go to Hotel Leopalace Sendai." "Please, go to Sendai International Center." "Please, go to AOBAYAMA campus (Faculty of Science), Tohoku University." If you plan to go to the Narita airport by train to catch a morning departure flight, your schedule might be tight depending on your departure time. Please contact one of the organizers; it could be better decision to stay at Narita for the night before the departure. The symposium will take place on the 3rd floor (Room ``Shirakashi'') of the Sendai International Center, which is located in the walking distance from downtown and next to the lower part of the AOBAYAMA campus (Aoba-hill), Tohoku University. Pre-symposium is to be held at the physics building on the top of the AOBAYAMA campus. Public buses to the symposium site are available from No. 9 bus stop of the Sendai station bus pool at the west exit. Information on the Sendai International Center and the access to the center can be obtained in the following WEB page. For those who want to have the Internet connection during the conference, we will prepare a wire-less access point and 100 base-T hub. A few computers will be prepared in the symposium meeting room, but it is recommended to bring your lap-top with wire-less or Ethernet LAN card if you need internet connection at the conference site. We have reserved rooms in the hotel ``Leopalace Sendai'' for those requested in the registration form. The hotel is located close to downtown Sendai and just next to the Sendai Washington Hotel which we previously planed to reserve in the 2nd circular. The room charge is 6,000 Yen + tax (5%) for single and 12,000 Yen + tax for twin including breakfast. All the rooms have the Ethernet port and the internet can be accessed for free if you bring your lap-top computer and an ethernet cable. The number of non-smoking rooms is quite limited and a smoking room may be assigned to the person who requests a non-smoking room. However, the hotel opened in this April and the interior is new. The symposium site, Sendai International Center, can be reached within 10 minutes on foot from the hotel. The registration fee of SENDAI03 is 10,000 Yen and it covers symposium proceedings, symposium dinner, refreshments during the symposium. The registration desk is open from 8:30 am at the symposium site and also during the welcome reception at the hotel ``Leopalace Sendai''. The registration fee is accepted only by cash. 15 min talk 5 pages. Those who gave oral presentation are requested to submit a camera-ready manuscript to the organizer (sendai03@lambda.phys.tohoku.ac.jp) no later than September 30, 2003 with a set of LATEX file, figure files as well as the postscript files processed by LATEX. If you failed download the class/style files from the World Scientific original site, please try followings. Welcome reception will be taken place in the evening of June 15, Sunday in the reception room (10F) of the hotel ``Leopalace Sendai''. Drinks and snacks will be served. The registration desk is open from 17:00 to 20:00. Symposium dinner will be held in the evening of the 16th at the Sendai Excel Hotel Tokyu in casual buffet style. The Sendai Excel Hotel Tokyu is a 15 minutes walking distance form the Sendai International Center (From the hotel Leopalece Sendai, it takes a 5 minutes walk). No formal dress is necessary. On the 19th, excursion near Sendai area is scheduled for participants of the post-symposium discussion at Sakunami hot springs. Detailed information will be given at the symposium. After distributing this final circular, further information will be distributed using the SENDAI03 Web page. It is strongly recommended to check the following page occasionally before your departure to Sendai. Those who would like to have additional information and any response from the organizers are requested to contact Professor Hashimoto at the addresses below.